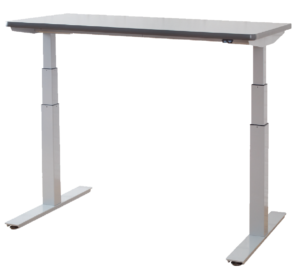 Height adjustable tables have become a popular choice in today’s workspaces. With so many brands and options to choose from, finding a table that satisfies your clients’ needs can be challenging – we are here to help! Ensures a smooth, quiet and quick transition. The upCentric features motors made by TiMOTION and takes just 17 seconds to travel the 26.5″ range from lowest to heights. The upCentric is one of the simplest height adjustable tables to assemble. Printed and video instructions make assembling the upCentric easy enough to complete in approximately 15 minutes. April 9th 2019 Ergonomist Josiah Allen of VelocityEHS’ Humantech recently interviewed ergoCentric’s Ken Hammond about the company’s ergoCentric Sit Stand which is three chairs in one: a sit-stand, a sit-stand with backrest, or a counter or desk height task chair. We make chairs for two people: the person who will sit in it and the person who will pay for it. That is why our priority is to provide customers with high-quality seating solutions that deliver the lowest total cost of ownership over the lifetime use of the chair.